I started Project Traffic Observer (Traffico) in 2017 to monitor traffic conditions using bus arrival times. 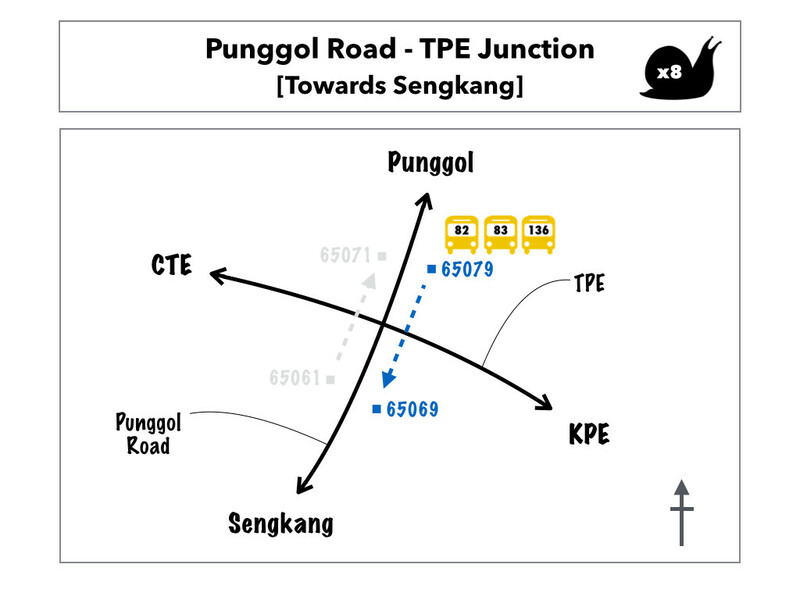 With it, I am able to study the traffic profile along Punggol Road (TPE). This stretch of road is infamous for its severe congestions so it was not a surprise that 2 routes on this road have been awarded the Snail Award champion for most of 2018, based on ranking across hotspots in Singapore. The opening of a new link between KPE/TPE and Punggol Central on 25 Nov 2018 promises to alleviate congestions along existing arterial roads in Punggol Town (source: LTA). 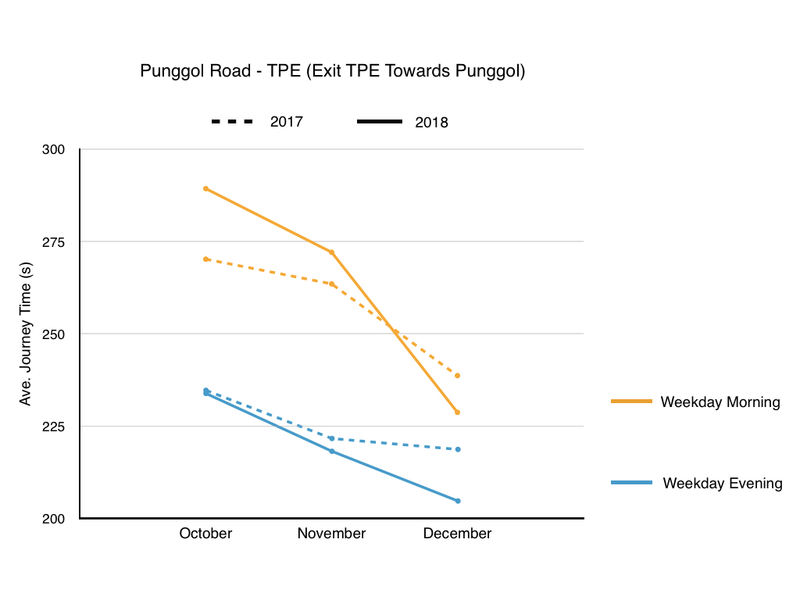 With months of accumulated data from Oct 2017, Traffico now offers year-on-year statistics to give us even more insights into the changing traffic profile of Punggol Road (TPE). The conclusions stated are my own opinion. You are encouraged to form your own hypotheses using information provided in the Annex. Traffico infers traffic conditions through bus arrival times. In summary, this is how it works. Currently, Traffico monitors these 4 routes in Punggol Road. I will focus on data from the most congested routes (i.e. Route 1 and 4) since they offer the most insights. The details of these routes are shown below. 4 6:30 - 8:30am 5:30 - 7:30pm N.A. 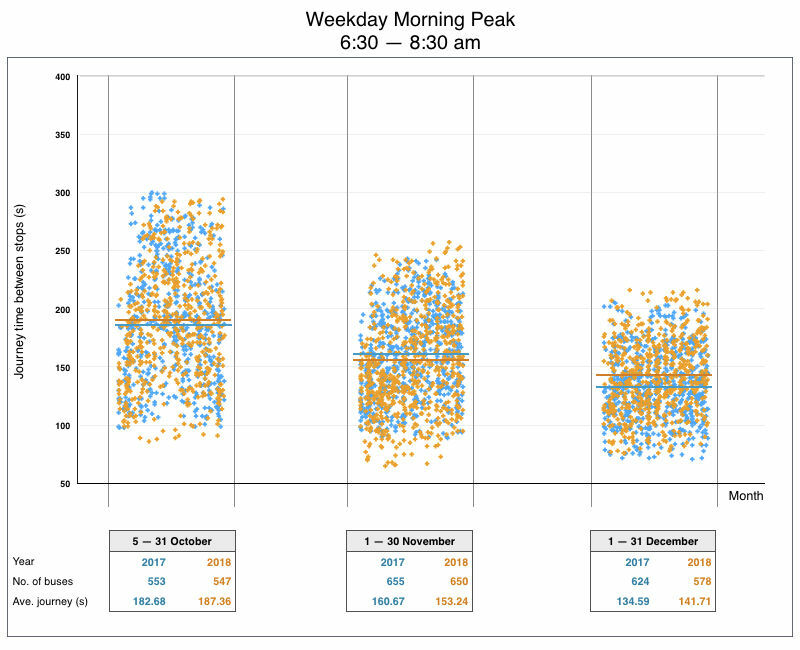 This is a ‘raw’ chart for Route 1 on December 2018 based on journey times within the weekday evening peak hours. 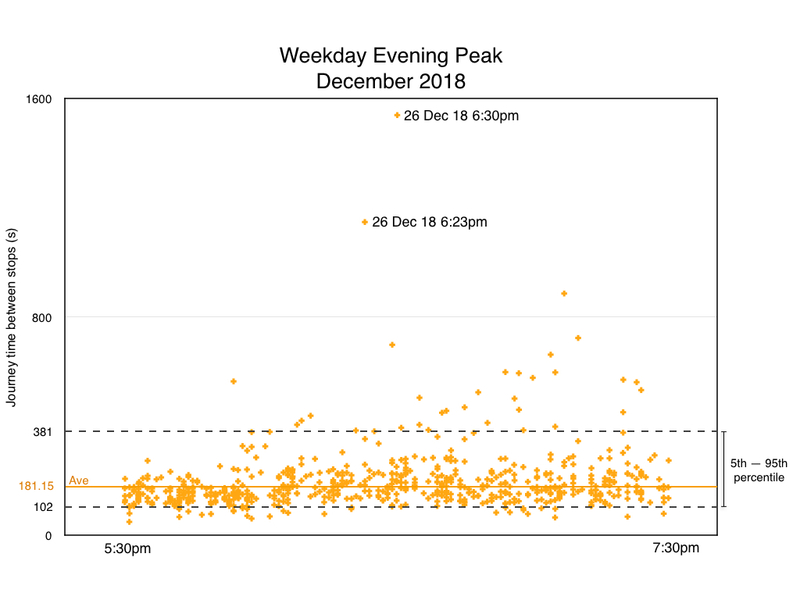 Notice the 2 highest peak recorded on 26 Dec 2018. While it gives me the confidence that they are likely accurate because they are taken from 2 different bus services (82 and 83) minutes apart, these unusually high numbers on that single day can inevitably pull up the monthly average. Furthermore, some of the high journey times could also come about from bus bunching or commuters taking too long to board or alight from buses. On the other hand, some numbers on the lowest range could be attributed to the absence of commuters getting on or off buses. 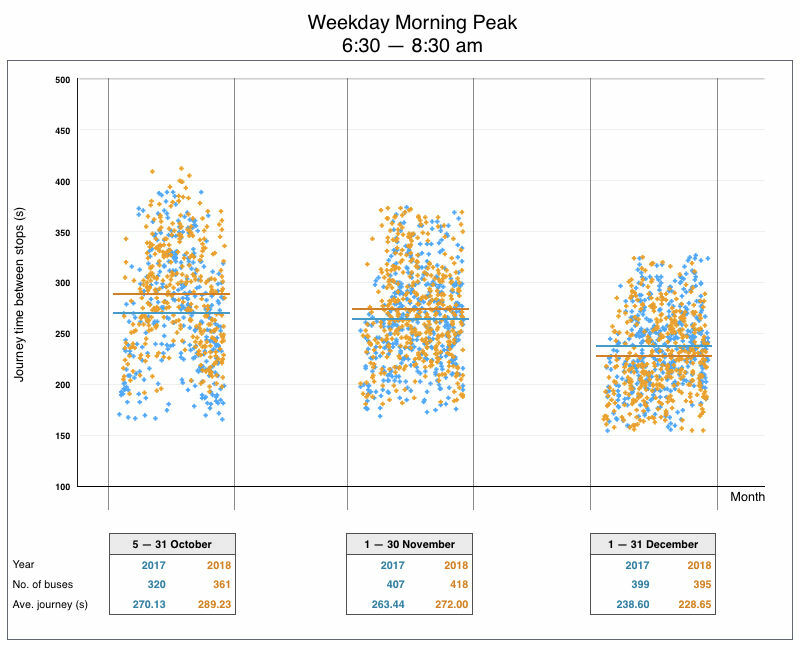 Hence, to focus on the general trend and prevent outliers from skewing the data, I will select only journey times in the 5th to 95th percentile to plot the averages required for this study. 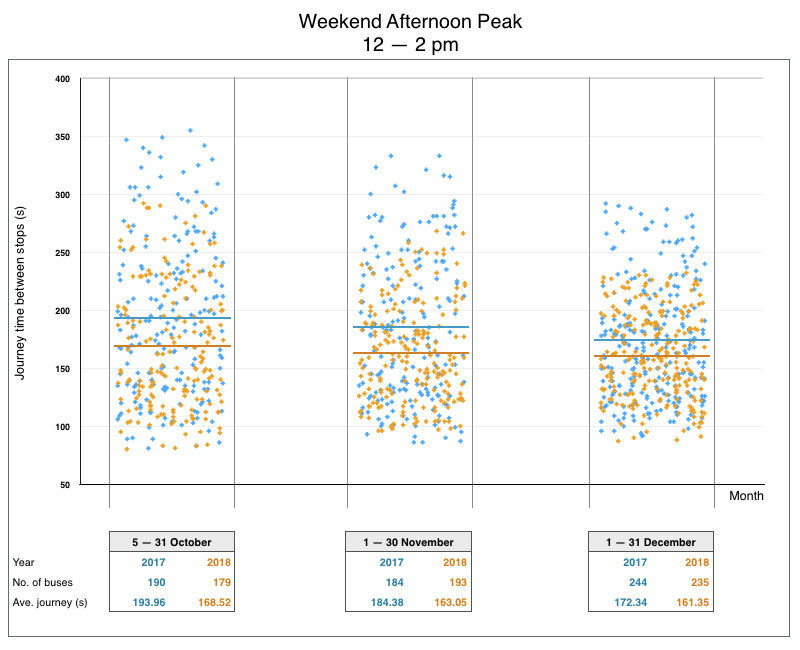 Generally, the average journey times are highest in October because of school days and lowest in Decembers. Weekday Morning The year-on-year average is relatively close across the months. The average in Dec 2018 is higher than Dec 2017. Weekday Evening For reasons unknown, the Oct 2018 average has dropped by 17.9% from a year earlier! The average went up 7.5% from Nov to Dec 2018. Weekend Afternoon Again the figures in October are puzzling; the year-on-year average has dropped by 13.1%. There is no significant drop from Nov 2018 to Dec 2018. 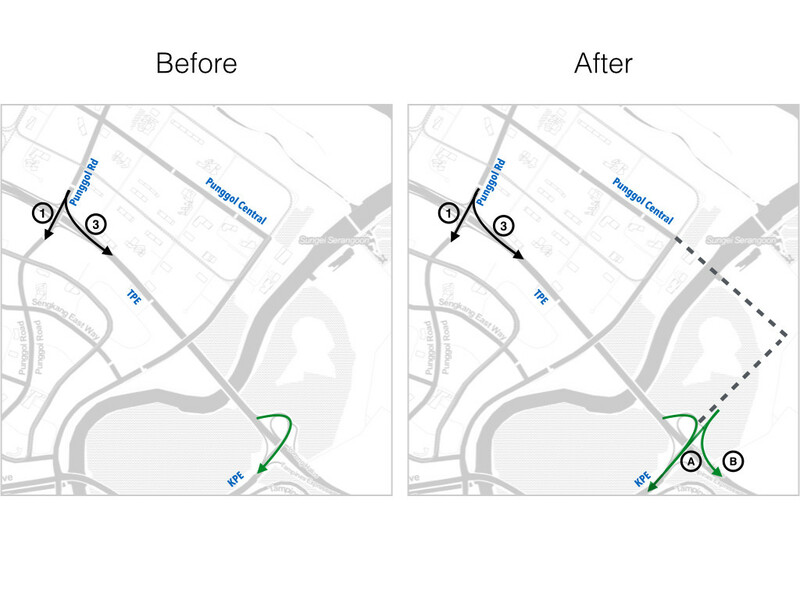 In summary, some improvements to the traffic conditions along this route were already observed in Oct 2018, even before the opening of the new link. In fact, after the link was opened, there was no significant improvement in Dec 2018. It is easy to see why with the help of a map. 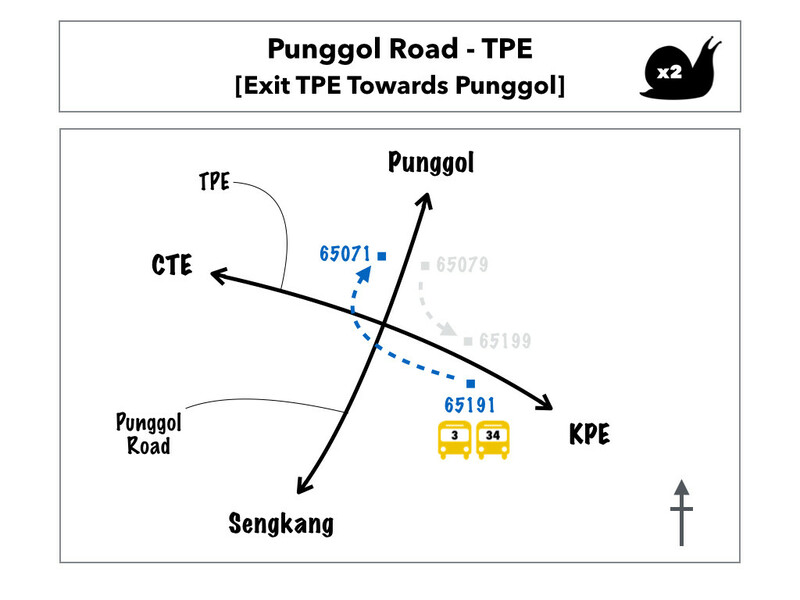 With the new link, motorists can head directly to KPE or TPE (PIE) from Punggol Central via (A) and (B) respectively. This is probably more effective in diverting traffic away from Route 3 rather than Route 1. 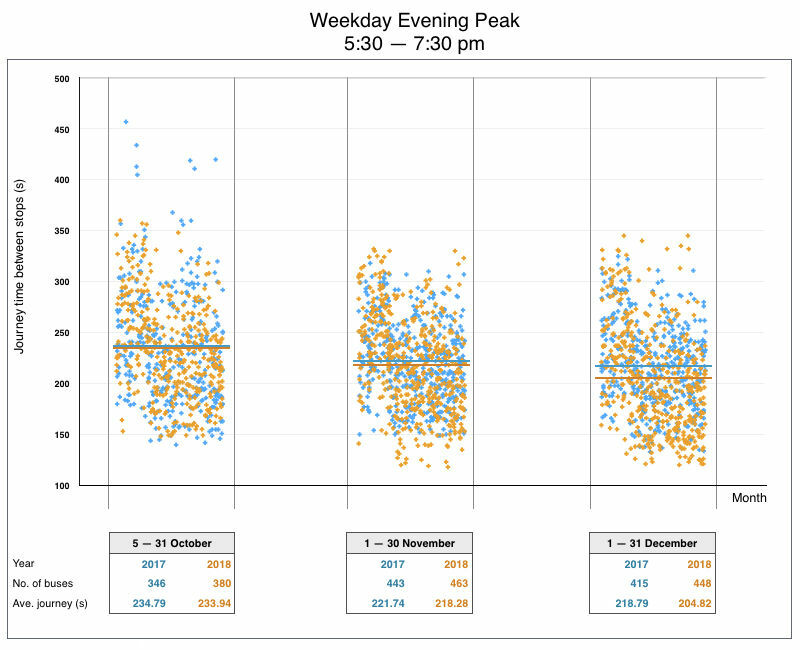 Generally, there is more traffic heading into Punggol in the morning than evening. There is also quite a substantial drop in Dec 2018 from Nov 2018 for both peak periods. 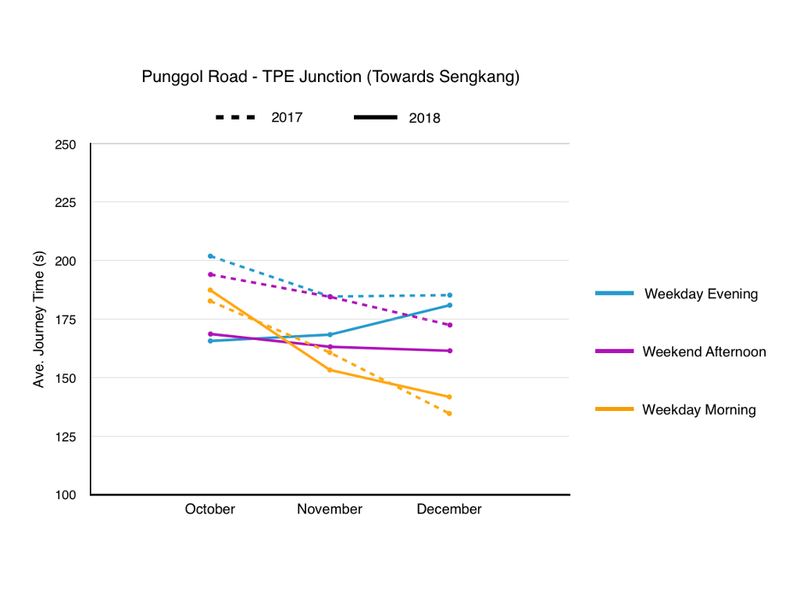 Weekday Morning There is more traffic in Oct 2018 compared to a year earlier. However, in Dec 2018, we see a 16% drop from Nov 2018 compared to a 9.4% drop a year earlier. 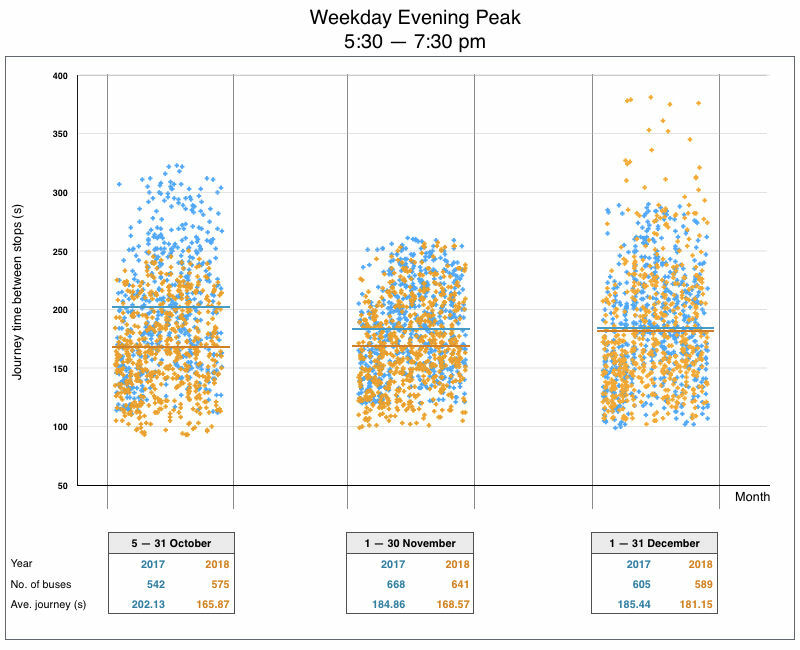 Weekday Evening There is not much change in traffic in Oct 2017 and 2018. However, in Dec 2018, we see a 6.2% drop from Nov 2018 compared to a 1.3% drop a year earlier. 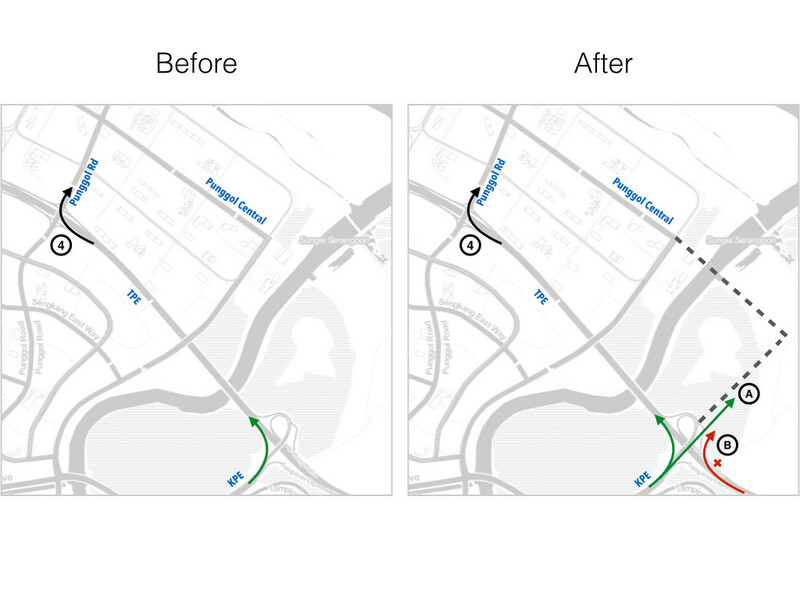 The results show that the new link helps to reduce traffic along this route. Again, it can be explained with the help of a map. The new link provides an alternative route from KPE directly into Punggol via (A). Hence some traffic is diverted away from Route 4. At this time, it is not possible for traffic from TPE (PIE) to use this link (B) else we might see an even bigger drop in traffic at Route 4. Going forward, the new link should ease a bit of traffic bottlenecks for now but with more developments taking place in the creation of the Punggol Digital District, traffic is likely to build up at some point. Fortunately, we now have some form of benchmarks for comparison. I would like to end on this note. When the link was opened back on 25 Nov 2018, the media was there and they interviewed residents on their views about the link. Most of them said the effectiveness of the link to alleviate congestions can only be known when school reopens in Jan 2019. I had the same thoughts too, until I started investigating the data. With Project Traffico, we now know that the effectiveness can already be seen a month ahead in Dec 2018, even though motorists are unlikely to have felt the difference then. Data speaks! 1. Data for Oct 2017 is only available from the 5th to the 31st. For consistency, I have included the same data range for Oct 2018. 5. Motorists heading towards TPE (CTE) will have to stick to entering TPE via Punggol Road or Punggol Way. 6. Generally non-residents enter Punggol in the morning and leave Punggol in the evening. Conversely, residents leave Punggol in the morning and enter Punggol in the evening. 7. The Global Indian International School (GIIS) was opened in July 2018.